Star Wars Fans will recognize Bounty Hunter Aurra Sing from Star Wars Episode I: The Phantom Menace and more recently from the Star Wars: The Clone Wars Movie and TV Series. You can meet Aurra Sing along with many other Star Wars characters at Star Wars Weekends in Disney World for 4 weekends starting May 21, 2010 at Disney's Hollywood Studios. May 21, 2010 not only kicks off the 2010 version of Star Wars Weekends at Disney World it happens to be the 30th anniversary of when The Empire Strikes Back debuted in movie theaters. Disney is marking the momentus event by having Jeremy Bulloch, the original Star Wars Bounty Hunter Boba Fett be the special guest host for all 4 weekends of the event. Boba Fett played an important role in The Empire Strikes Back as he successfully captured Han Solo and encased him in carbonite for transport back to his employer Jabba The Hutt. 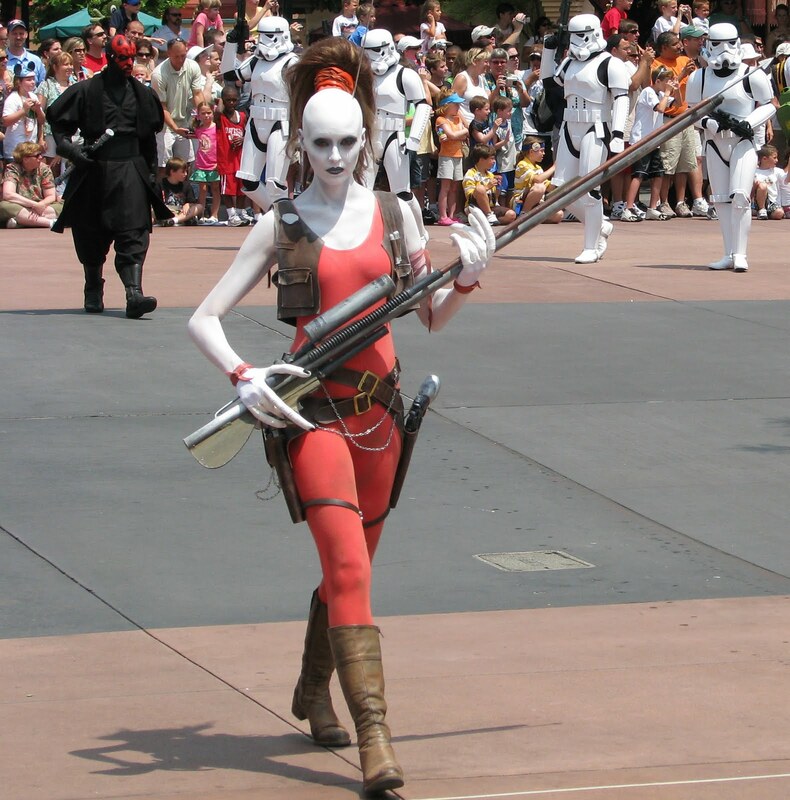 Aurra Sing certainly gets your attention when you see her during Star Wars Weekends. The very white skin, extra long fingers, and communication antennae that entends from her skull make her stand out, even if she wasn't carrying a gun or two. She doesn't get the star power attention that some of the Star Wars characters garner, so it is easier to have your picture taken with her. Although with her recent inclusion in the story line at the end of season 2 of Star Wars: The Clone Wars TV series her popularity may be increasing. The story line links her to the young Boba Fett. Star Wars Weekends is a fun event whether you are a Star Wars fanatic or just a casual fan. It is great to see all of the Star Wars characters walking through the park. They are more than willing to pose for pictures and add a lot of fun to your vacation. There is also the opportunity to see and possibly meet actors and people that made these landmark films. After attending several Star Wars Weekends over the past few years, I can certainly say that it doesn't get old and the folks at Disney World always keep adding new events and activities to make it worth while to attend this Disney World Special Event. From park opening to the Hyperspace Hoopla that ends each day, the Star Wars Weekends are definitely one of the best Disney World Annual events to see. 0 comments to "Meet Bounty Hunter Aurra Sing At Star Wars Weekends"